Try out the “Total Wipeout” style Aqua Park (inflatable outdoor water assault course) in Rother Valley Country Park!. Complete with huge inflatable slides, trampoline, inflatable climbing wall, runways and of course the blast bag! This is the ultimate outdoor water experience! The Aqua Park can be booked for team building events or groups. Smaller groups (less than 15) and those not requiring catering, can be booked online. Please Aqua Park for more information on booking for larger groups. See Their bar and catering page for more information about catering for group bookings. 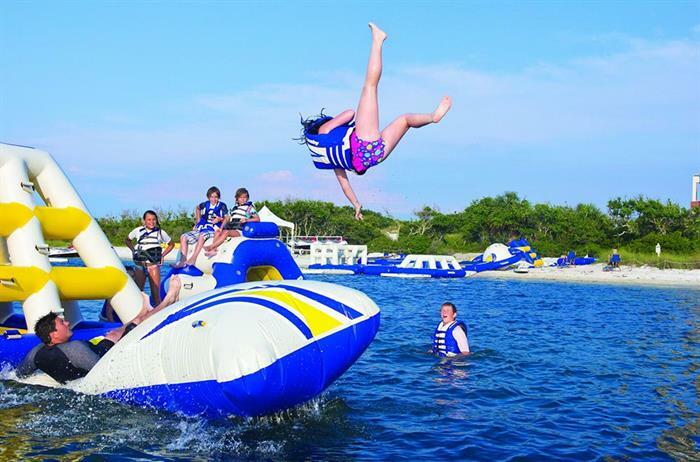 The Aqua Park can also be combined with learn to kneeboard/ wakeboard team events to create a full day experience for your group. Food is served after the session, outside on our cafe tables. If your Aqua Park session is booked for 11:00 a.m, they would serve food to your group at approx 12:15 to allow everyone chance to get changed. Please contact them to book. PLEASE NOTE: There are safety requirements on the Aqua Park, including a minimum swimming distance standard of 50 metres. Please take a few minutes to read our FAQ’s to ensure that you understand how the sessions will run and what will be required of the children. Children’s parties are not in a private party area or with a party host, they simply allow you to pre-book food to make it a better party experience. Please visit the Aqua Park for opening times.